Code Buster is a microgame found in the IQ folder in WarioWare, Inc.: Mega Microgame$!. It later appears in WarioWare Gold as part of Dribble and Spitz's set. The objective of the game is to follow the instructions on the screen and press the buttons to enter the commands. "While holding , press !" 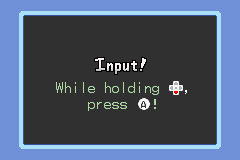 "After pressing 5 times, press !" "Press 3 times, then twice!" "Press up, down, left and right in the proper order!" "After pressing 8 times, press !" "Press 2 times, press , press 3 times!" "Press , , , , , , , !" 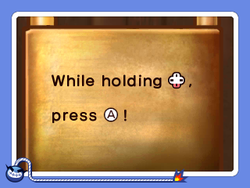 In WarioWare Gold, the game has the player reading the code out of a spell book. The context varies with each stage. "Press , , , !" "Press 3 times; press 2 times!" "Press 2 times; press 3 times; press !" "Press 3 times; press 2 times; press 3 times!" "After pressing 7 times, press !" On level 3, one of the codes is a reference to the Konami Code. This is the only microgame in WarioWare, Inc.: Mega Microgame$! where is used, though it is used in a way that makes the player fail the microgame. This page was last edited on April 4, 2019, at 00:25.